Cars have always been a big deal in the Willard family. Andrew Willard fondly remembers his dad’s spotless1953 black MG. It was slightly more complicated to work on than a lawnmower engine. Andrew’s older brother Jim introduced a 1968 ice blue Cougar into the family, and the three men transformed it into a college-bound muscle car. When it was Andrew’s turn, he chose a cool 1970 primer red Volkswagen Bug. In 2008, after Andrew’s post college “sensible” career had lost its luster, his wife, Kelsey Hawkins Willard, and their three children, Samm, Wolfgang, and Mary Lynn fully supported his decision to live his dream. After investigating several opportunities, he settled on Grease Monkey. It had the right people, such as a franchise owner in Mooresville, NC, who traded in a corporate job and still loved it eight years later. And, Andrew Strangeio, a Grease Monkey executive. “Andrew wiped off the glitter and showed me the honest realities of owning a franchise so that I could make a sound business decision,” Andrew Willard said gratefully. In addition to this, he liked one more aspect of Grease Monkey. It is summed up in the tag line, “Only what you need—guaranteed!” For Grease Monkey this is more than empty words, it is a promise. Marie began bringing her car to Grease Monkey, located next to Sonic, after accompanying her mom on a visit. Marie noticed that the “pit crew” helped her mom track down a problem on her Jeep that went beyond the normal scope of a full service oil change. Because Grease Monkey does not do major repair work, Marie knew that they had nothing to gain but trust. Actually, the Grease Monkey pit crew often finds itself diagnosing other problems. They just cannot help themselves. Like Andrew, Manager Bill Davis, has loved cars since early childhood. In fact, he has raced cars since he was 15 years old and currently races the Grease Monkey four-cylinder dirt track car at Friendship Speedway in Elkin, NC. When he was barely out of elementary school, Bill helped his dad put a new engine in a van. So when Grease Monkey needed another member for the pit crew, Bill recommended the second best mechanic he knew, his little brother Josh. Josh said shyly, “It seems like it comes natural for us. I got my certifications right out of high school and went to work at an oil change franchise, but Grease Monkey is the best and Andrew is by far the best boss I have ever had. He rolls up his sleeves and works right alongside us. The Davis brothers are both in their 30s, married, and have children. They are very aware of the value of a vehicle, the value of money, and the value of time. These shared values have kept Don and Linda Dieball (in their 70s) coming back to Grease Monkey for seven years. “Other places started pressuring us so we stopped going there,” Linda said. “This might sound corny, but at Grease Monkey I feel like I am family. When they said we needed brakes, Don and I knew they were being honest. Then they did an excellent job at the lowest price. Linda also likes the extra goodies that come with a full service oil change. When she picks up her car, it has been vacuumed, the outside windows have been washed, the fluids are all topped off, and her tire pressure has been set. Additionally, in between oil changes, Linda can come in monthly to have her fluids topped off and receive up to one quart of oil at no charge. Linda uses these opportunities to “chat” and sometimes she brings in some goodies of her own, such as a homemade apple pie. “When you are retired,” Linda said, “you need to know who you can trust. 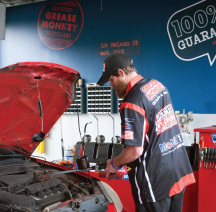 We can trust Grease Monkey, so we take our cars in for their annual State Inspections, changing our radiator fluids, and any other maintenance that we need. We send our friends there too!” Grease Monkey makes it easy for customers to keep track of their vehicle maintenance. Andrew believes that regular maintenance protects your vehicle while you own it and even when you decide to sell it. As an added service, Grease Monkey reports all of your maintenance to CARFAX, so that you do not have to keep track of the receipts. It confirms that you have taken care of your car. It is equally important to protect your warranty. That does not mean that you have to go to a dealership. In fact, in 1975, the Magnuson-Moss Act was passed which allows people go to places like Grease Monkey, which use products that meet or exceed the manufacturer’s requirements, and therefore maintain the warranty. 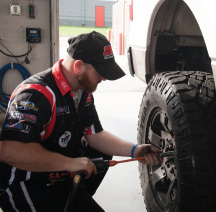 In addition to the products, Grease Monkey has a trained pit crew—including three certified brake specialists. Andrew is especially proud of his products, which include Eco-Power, environmentally friendly oil that uses 85% less energy to produce, Mobil conventional and Mobil 1 synthetic oil. Recently the Mobil 1 film crew came to Kernersville to document one local resident’s success story—driving his car for 454,155 miles using Mobil 1 oil. To see the 2-minute video, visit YouTube.com and search for Mobil 1 Engine Protection Through 454,155 Miles. Grease Monkey is a drop point for recycling oil-based products and even electronic products such as flat screen TVs, computer monitors, or cell phones. Additionally, Andrew Willard and his pit crew support the Kernersville Chamber of Commerce Recycling Day, the East Forsyth High School Girls Shooting Team, Kids of Childhood Cancer, the Susan G. Komen Walk for the Cure, and more. “We love the people of Kernersville. Just like we take pride in helping people maintain their vehicles, we love how this town takes pride in maintaining its traditions. We will see you at Spring Folly,” Andrew said with a smile. Award-winning journalist Patty Jo Sawvel can be contacted at pjsawvel@gmail.com.